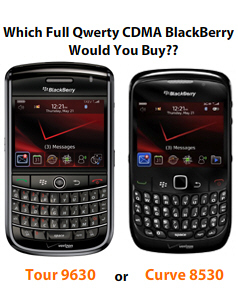 CrackBerry Device Poll: CDMA Customers, of the BlackBerry Tour and Curve 8530, Which Model Would You Buy Today? Pretty much everything else on these devices -- memory, speed, operating system -- are on par. The form factors are different but that is a matter of preference - I personally really like the look and feel of the Curve 8530 a lot. Screen pixels make a big difference for web browsing, but otherwise are not too big of a deal. The camera difference will be critical for some, not for others. Pricewise, the Curve 8530 is selling on Verizon right now for $79.99 on a 2yr contract vs. the Tour at $99.99. A $20 differential really isn't that big - so I'd argue money is not a factor in deciding which to purchase at this moment in time. So... BlackBerry Tour 9630 or BlackBerry Curve 8530.... That IS the Question! Cast your vote above and let us know in the comments what it was about either device that would make you choose it over the other.